Thought for the day: Missing-digit tasks are great for developing a deeper understanding of place value and properties of addition and subtraction! Encourage students to use manipulatives (such as base-ten blocks) or diagrams to support their thinking and their explanations. I notice subtraction equations with digits missing. I notice that both of the equations show a 2-digit number minus a 1-digit number. I notice that there are some easy ways to fill in the boxes to make the equations true. I wonder if finding easy solutions will help me find more solutions. I wonder if it would help to use base ten blocks or to draw pictures. I notice that the first digit in the top equation cannot be 3 or greater. I notice that if I choose the second number (subtrahend) first, then I can add it to the difference to find the first number (minuend). I wonder if there are patterns in the solutions. I notice that when both numbers go up by 1, the difference stays the same. I wonder how many ways there are to fill in the blanks for each equation. I notice that I can make new problems by changing some of the digits. I wonder if my new equations would have the same number of solutions (ways to fill in the blanks). I wonder how it affects the number of solutions when I make small changes to the digits. I wonder what would happen if I made the subtrahends into 2-digit numbers. Create new equations by changing the digits. Create new equations by changing the number of digits (including more “boxes”). Try to create equations that have a certain number of solutions. I notice that when I add 1 to both the minuend and subtrahend, the difference stays the same. I notice that it helps to think of the size of the numbers, not just the rules for subtraction. I notice that it helps to organize my equations into lists that have patterns. I notice that I can make up new rules, like (1) all of the digits have to be different, or (2) certain digits are not allowed to be used, or (3) certain digits must be the same! I notice that there is no end to the new math challenges I can create by using larger numbers and filling in different combinations of digits. I wonder If I can still count the solutions when I make the subtrahend and minuend have a lot of digits. I wonder what would happen if I allowed some of the numbers to be negative. 19 – 0 20 – 1 21 – 2 22 – 3 23 – 4 24 – 5 25 – 6 26 – 7 27 – 8 or 28 – 9. 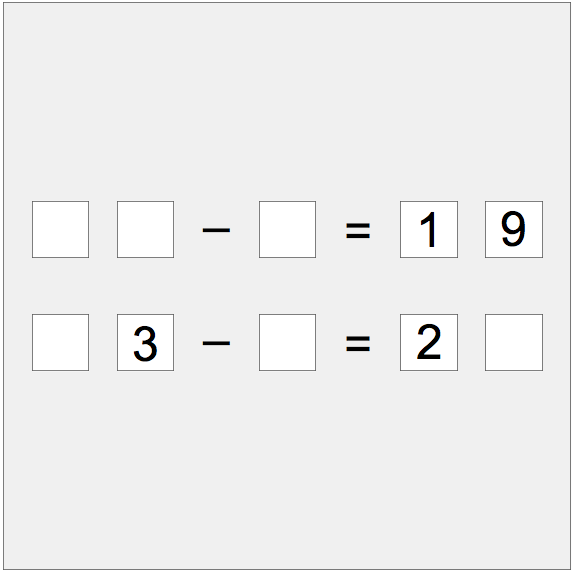 Students may start by searching for and listing equations randomly. If so, once they have found a few solutions this way, encourage them to look for patterns in their solutions or to arrange their solutions in some kind of logical order. The second equation must be 23 – 3 = 20. Ask students to explain why there are no other solutions! What would happen if the subtrahend had two digits? Why? Encourage students to create and solve their own puzzles like these. Some of them may want to choose very large numbers. If so, let them try it, and see how they do. This can be excellent differentiation and formative assessment, because you can watch how they think and ensure that they are working on tasks that best suit their needs and interests! In general, searching for all solutions is an excellent task because it forces students to organize their solutions, find and extend patterns, think strategically, and focus on the meaning of subtraction. Mathematicians ask this sort of question all the time!